The Weekend Gourmet: Springtime In Paris...By Way of la Madeleine's Country French Trio! Springtime In Paris...By Way of la Madeleine's Country French Trio! Spring is in the air...and the warmer temperatures put me in the mood for a romantic springtime trip to France. I look at blue skies out the window and daydream about sitting in a relaxing French countryside café enjoying tasty treats with Michael. Lucky for our wallets, la Madeleine makes it easy to enjoy a taste of France here in Texas without having to pack a suitcase! Symbolic of the comforting and flavorful foods found in quaint markets and cafés along the streets of France, la Madeleine is offering diners their Country French Trio for a limited time. 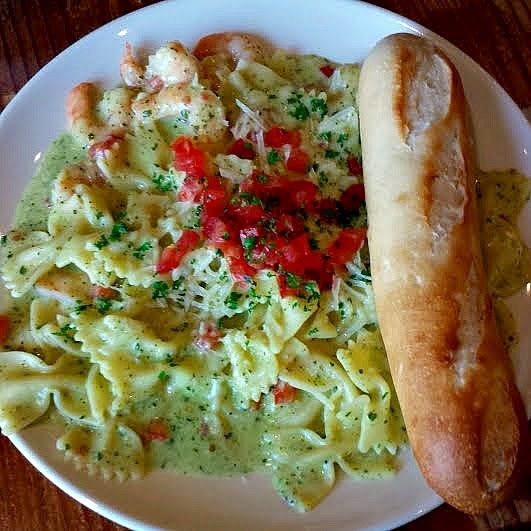 Michael and I were recently invited to our local la Madeleine to try a Country French Trio, along with a seafood pasta dish that can be enjoyed during Lent. Chicken Friand, a flaky puff pastry square filled with diced chicken, mushrooms, onions, and Swiss cheese. This dish comes with creamy wild mushroom sauce to pour over the top. Spinach Pochette, which features a creamy spinach and Swiss cheese filling in a puff pastry shell. Quiche Lorraine, which features a buttery crust filled with a creamy egg, ham, bacon, and Swiss cheese custard. 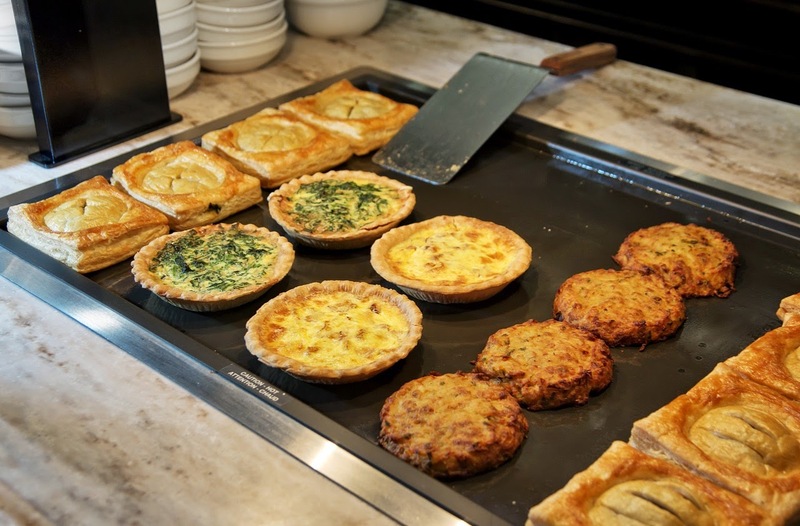 Quiche Florentine, which features a buttery crust contains filled with a house-made egg, spinach, and Swiss cheese filling. The French Country Trio also includes a choice of delicious soup or salad. Options include White Bean & Vegetable, creamy Tomato Basil, French Onion, or Cream of Mushroom soupes. If salad's more your thing, you can choose from the Caesar or Wild Field petite salades instead. 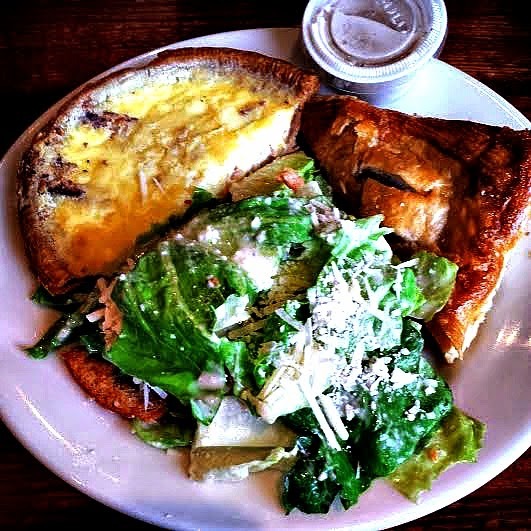 For my personalized trio, I opted for the Chicken Friand, Quiche Lorraine, and a petite Caesar salade. The Chicken Friand was crispy on the outside, with a flavorful filling inside, and the creamy mushroom sauce paired perfectly with it. The quiche was decadent and creamy, with a smoky bacon taste. The crust was tender and buttery...so good! The Caesar salad provided a perfect light counterbalance to the richness of the rest of the meal. The portion size was perfect for me to be comfortably full. I especially enjoyed that this trio encouraged me to try items that I don't normally order when I visit la Madeleine. Michael decided to try a seafood pasta dish that can be enjoyed as the Lenten season winds down. The Pesto Pasta started with bowtie pasta tossed in a creamy pesto sauce. The pasta is topped with shrimp, diced tomato, and parmesan. It came with a toasty baguette for dipping in the flavorful sauce. The pasta was creamy, with a subtle pesto flavor. On our way out the door, we couldn't resist stopping by the bakery counter for a sweet treat to take home for dessert. I opted for an indulgent chocolate chunk cookie, while Michael opted for his favorite: oatmeal raisin pecan. If you've never been to la Madeleine, you're in for a treat. The company was founded in Dallas in 1983 and now has cafés located in Arizona, Georgia, Louisiana, Maryland, Oklahoma, Texas, and Virginia. 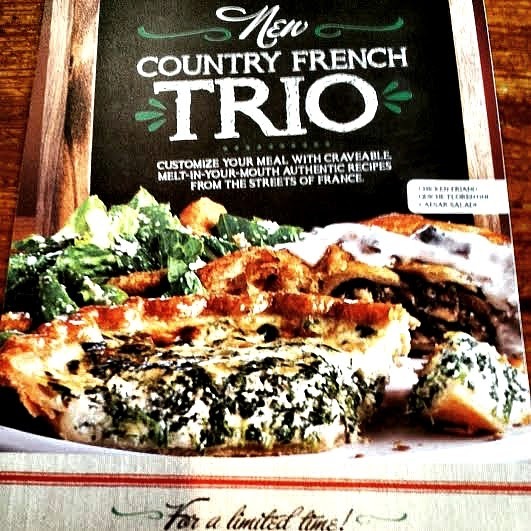 The French Country Trio will be available until early April and costs less than $10 -- making it an affordable indulgence for lunch or dinner! Disclosure: To facilitate this feature, la Madeleine provided us with a gift card to try the Country French Trio and a dish than can be enjoyed during Lent. All opinions expressed are solely my own.